Last Thursday was Valentine’s Day. While we didn’t make any special plans for that day, I was secretly hoping and wishing that Alexis got me something, anything, just because it’s Valentine’s Day. And it’s been a long time since I received a card or even flowers from him. As it turned out, the only Valentine’s Day card I received was from Sophie. And I forgot to add, when I wished him Happy Valentine’s Day in the morning, all I got was a “Yah, Happy Valentine’s day. Can you please go and get ready for work?. Pretty much a shoo fly response which was the first dampener. I tried to make him feel guilty about it and sent a whatsapp message at mid day only to to be shot back with more, “Next time can you please get ready faster, wake up earlier, yadah yadah…” So I was bummed…. the.whole.day. After you become parents, the only person who is getting all the lovin is the baby or the kids. They are the ones who are receiving the hugs, the good night kisses and even the silly grins. Truth be told, Sophie is now at an age that really zaps up the rest of our energy and time after we get home from work so it’s no wonder that we don’t even have time for a proper conversation as a couple. But that evening, as I wrote this familiar verse from the book of 1 Corinthians 13:4-8, on a handmade gift I made for Alexis, I got reminded that love is no longer just a word that we utter on our lips. For us, love is now an outward demonstration of our vow, our commitment that we make to each other every single day. While we don’t express it with flowers of gifts, we do it with acts of service, like taking turns to tuck Sophie to bed so that one of us can have a quiet evening. Or when I cook a healthy meal for him that not only feeds the body but nourishes the soul. Yes, we may not wake up feeling dizzy with love on Valentine’s day anymore, but I know that we have a love that is anchored in the security that we have each other’s back and am looking out for each other’s best interest. The kind of love that sticks around even when things get tough. And I’m reminded that this love is one that needs effort. It needs constant nurture with encouraging words, acts of service, appreciation and dates from time to time just to keep the sparks alive. Which we did post Valentine’s Day with a nice meal and a movie. So that my friends is what love is for a married couple. Not the most exciting kind of love that you may look forward to but it’s a love that always protects, always trust, always hopes and always preserve! Do link up every Monday with my Motivational Mondays post. The theme for February is LOVE. Don’t forget to grab my badge and include it in your post after you have linked up and leave me a comment too. 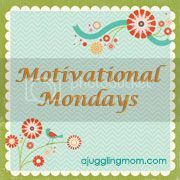 I will be hosting Motivational Monday every week and I hope that you can join me every Monday. Have a great week ahead! I have to agree with you! I too had certain expectations which started to turn into disappointment by the end of the day (even though we have never really celebrated vday). But that evening I thought about how far we have come and how we now show our love in very different ways and ended the day feeling thankful for whatever we now have. Thanks for sharing! this is such a great reminder, especially the poster! yeah I liked the poster too. So true, so true! You know… we’ve never celebrated V-Day, not even before marriage, because back then, chances are I’d be at the restaurant serving people who do celebrate the day! Last Thursday, I was at VivoCity – because I had to drop off some things at our restaurant there. Bad Move. I was stuck in traffic going to Vivo (at the main road) for about 20 min. I suppose a lot of people were heading there for a Valentine’s dinner. It’s not that I was envious. Not that I didn’t celebrate love. When the hubs came to pick me up (he was stuck in front of Vivo for an hour coming by!) I told him about this, and how bad I felt for not having the warm, fuzzy feelings or even envy. He told me this, which I suppose made sense to me: When you love someone, you don’t have to give things to show that you do. But it’s nice when partners do that, especially when it’s unexpected. We both have no expectations of it, perhaps that’s just the way we see things. For others, it’s not only nice to receive, but it makes them happier to give. But you’re right. More than anything else, I think it’s always nice to be appreciated, and to know that we are loved. Sometimes we forget because other things or the kids take precedence and sap all our energy, and we need a reminder now and then. Yes I think you hit the nail on the head, it’s feeling appreciated that’s what we love to receive now as a wife and mum. And we all need a reminder to show our appreciation to our spouses whenever we can. It’s the same in our family. My husband is the least romantic man on the planet, which is a shame because I love a bit of romance. We did nothing this year at all. I actually think although you don’t have to give things to show you love someone, I still think you need to do things to make the person you love feel loved and appreciated.